Today was another busy travel day. We met at school at 7am and said goodbye and thank you to our host families. There were several of the host mothers who had tears in their eyes as they said goodbye to their "children." We waved from the bus to a curb full of our wonderful host families waving goodbye. The bus ride to Toulouse airport took about two hours, and we were pleasantly surprised by the mostly sunny weather. We arrived early to the airport, checked in our bags, passed security without incident, and bought sandwiches for lunch on the plane. 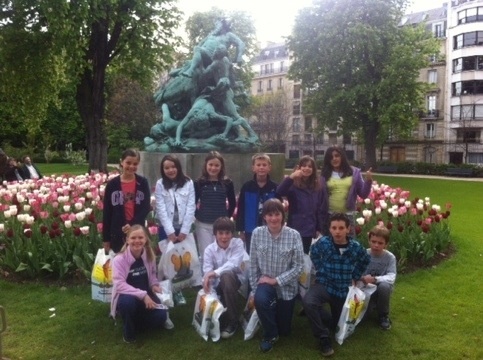 The ride was quick to Paris, and once we had gotten our bags (that are very full with presents from the host families! ), we got into a few taxis to head to the hotel. Upon arriving at the hotel, we checked in and met with Philippe Dietz. The children were so excited to be in a hotel room with a friend. After a bit of time to rest in their rooms, we met to go to Chantelivre, a wonderful bookstore, to buy French books. All of the children were thrilled to be there, and they all bought several books. You can see in the attached photo that they all have their bags from the bookstore. We took a little walk afterward, and this photo was taken in the Luxembourg Garden. We are looking forward to dinner with many family members and friends this evening. We'll send you photos and updates from that with tomorrow's update. I, for one, can't believe how fast the trip has flown by. Tomorrow we look forward to exploring Paris before heading home.